Join the Geoffrey Birthdays R Us Club & get lots of free goodies. Free birthday countdown, birthday cards, party tips & a special surprise from Geoffrey. 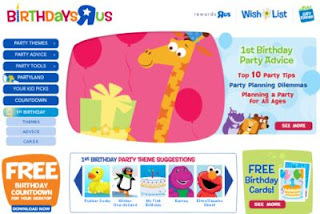 Click the link below to go to the Birthdays R Us club at Toys R Us.